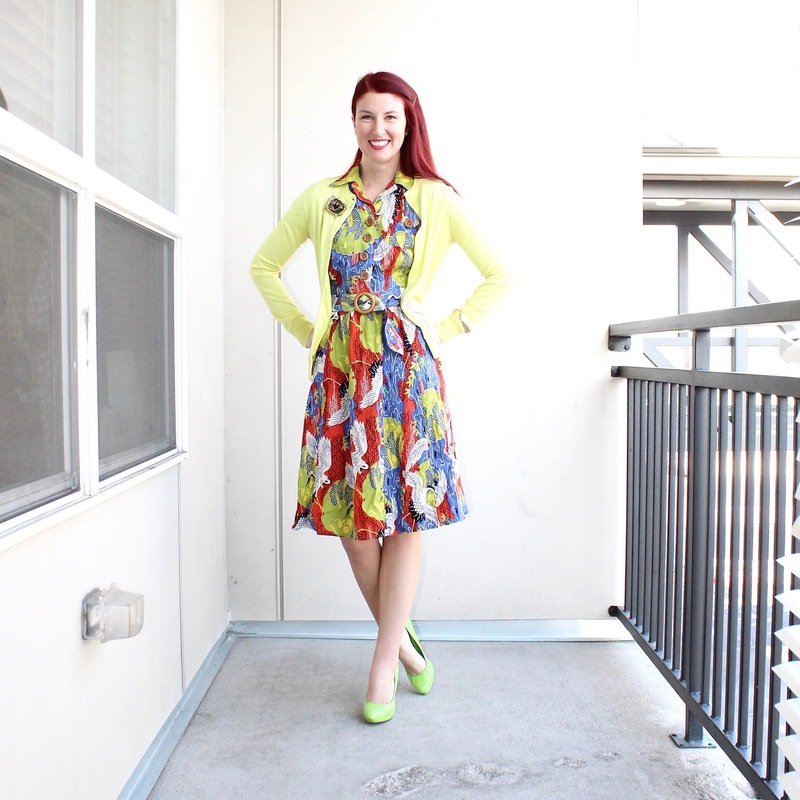 All About the Outfit: Happy Tuesday, all! As I mentioned in my first half of my Most Worn Vintage Brands of 2016, I'm trying to wear my Trashy Diva pieces a bit more. For various reasons they'd get left in my closet and I'm trying to amend that in 2017 because I truly love all of my TD pieces! Well, I have several great pieces that I've had for a while that I could immediately start wearing now...but Trashy Diva recently put a few collections on sale and I totally splurged! Considering TD pieces are often kind of pricey, it felt good to get 3 new pieces for a price that would often be in the neighborhood of around one piece!! I've learned that if you want Trashy Diva item you have to either get something the second you want it or utilize the sales when they come or the piece you want will likely sell out. (And be re-sold on eBay and swap groups for MORE than the original retail!!!) I got lucky in my early Trashy Diva days, but I've missed a lot since then. ANYWAY, this is one of my new pieces! I own two dresses from TD (check out the Chinese Opera one HERE) so this makes three in my collection (plus a handful and a half of skirts). 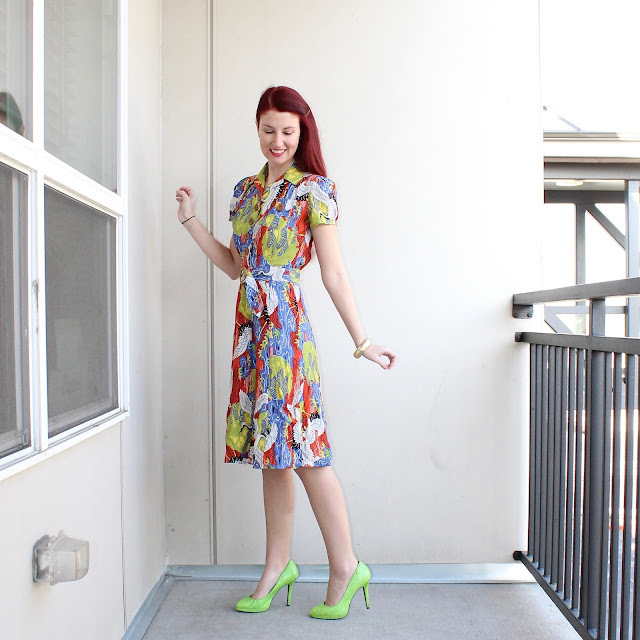 This is my first 1940s inspired dress from TD (The Sweetie Dress) and I have to say that I'm a fan! Hell Bunny is probably the only other dress company from which I own 40s dresses from, so it felt good to branch out! The fit is perfect (size 2 for measure) and as always the quality is pretty great. My only complaint is that it's a little tricky to get off. I have to flip it inside out and roll it off over my head and I borderline get stuck for a moment or two, ha. The Sweetie Dress is a side zip with front buttons, but I can't really step out of it. Oh well, this is kind of common I feel. Small sizes forget to take into account that some of us slender gals have broader shoulders than the rest of our proportions, ha! And seriously, it does come off okay after that initial pause trying to get it over my shoulders. I've had WAY worse dresses that were far more stubborn! I took these photos on Friday, kept the dress on, and immediately went out to dinner with some girlfriends and...a Chihuahua. Yup, a Chihuahua totally accompanied us to a sushi restaurant. Don't believe me? Check out my Insta for proof! Because it's winter (boo!) and layering is necessary, I took off the cardigan for one photo because I love you guys and wanted you to see the true fit of the dress! Style Details: I wanted to play with the yellows and greens in the dress for my first styling. I didn't have too many accessories in the exact color pairing, but I chose colors that if you were to mix them together they would be an identical match! You've styled this dress so well! I think you look beautiful in this dress. It's hard to pass up a good sale! 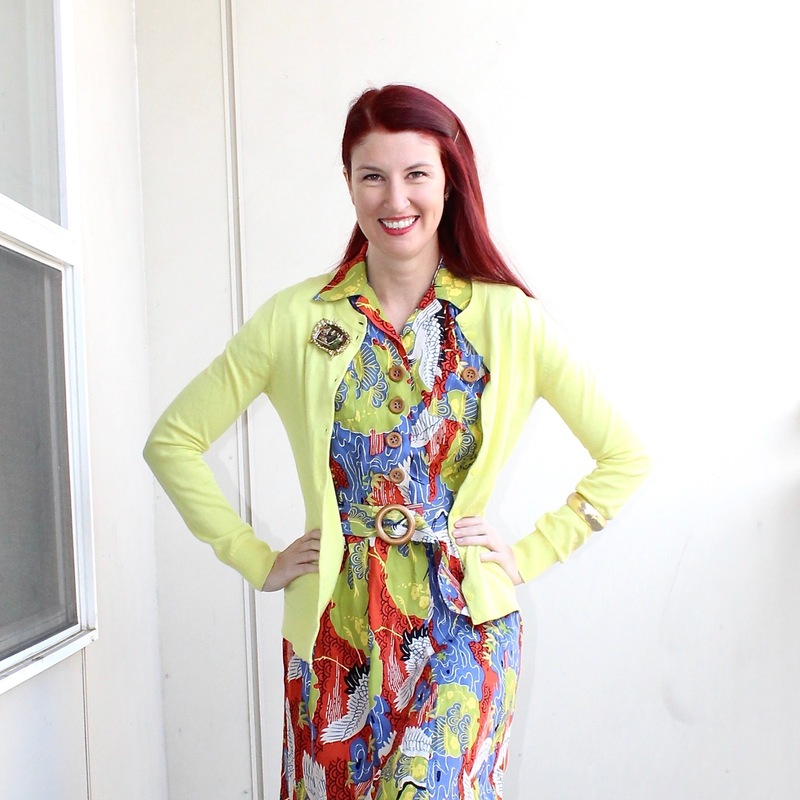 The colors of this print are so fun, and I like the belt detail. I really like your dress, Lauren, you look really feminine in its, what's more, it has unique prints and colors, which remind me shades of parrot ;) And btw, dinner with chihuahau sounds really lovely, dear! The Sweetie isn't the best style on me, but I love it on you. The cranes print is so dang gorgeous, too. I love my L'amour in that print. 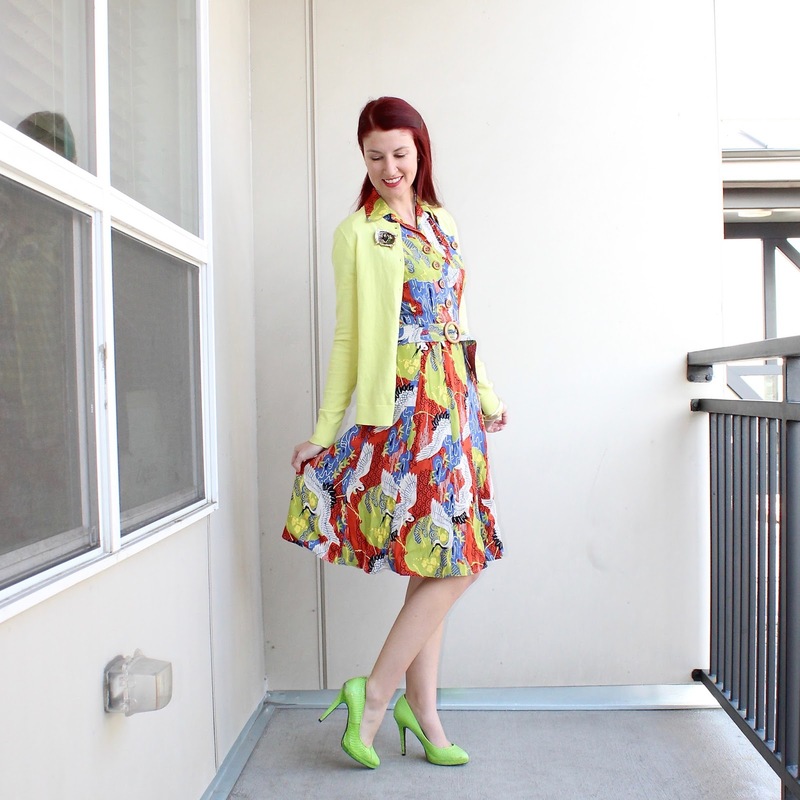 I really love how you paired it with yellow & green, too! What a great outfit. Love your dress, the colour is amazing! Oh my this dress fits your gorgeous figure perfectly! 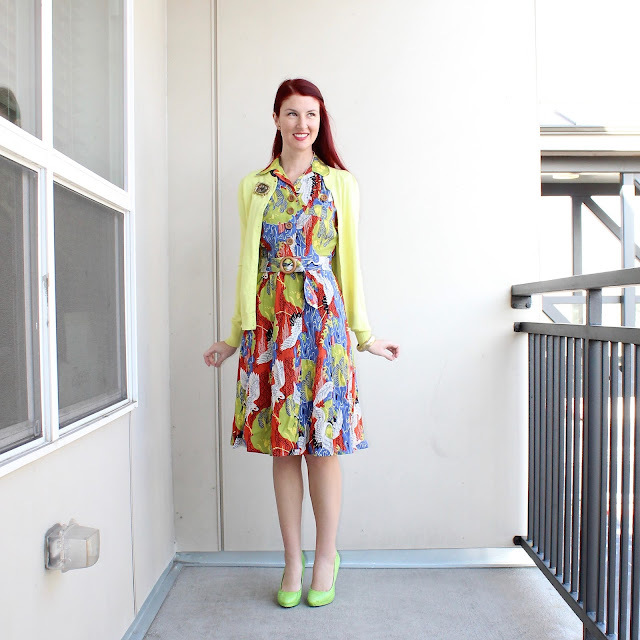 I'm loving the print on this Trashy Diva dress, the 1940's style and the colours! Love the bright colors, esp those shoes! Swoon. Holy crap this dress looks amazing on you! <3 I especially love the colors on you but the cut is also a perfect choice! Love the colors you've paired it with too! <3 So glad you were able to grab this dress during the sale!